North Korea is making the world uneasy with its missile launches. It’s also driving business for defense contractors. Take, for example, US defense giant Northrop Grumman’s planned $7.8 billion purchase of Orbital ATK, a smaller contractor focused on aerospace and missiles. As part of the deal—announced Monday (Sept. 18) and subject to regulatory approval—Northrop said it will pay $134.50 for each Orbital share, a 22% premium on Friday’s closing price, and assume $1.4 billion in net debt. What makes Orbital so attractive? The tensions surrounding North Korea certainly don’t hurt. That has the US military focused on missile defense systems, and US president Donald Trump pledged last month to increase spending on missile defense systems by “many billions of dollars.” On Sept. 18, the US Senate authorized $700 billion in military spending for the fiscal year starting next month, in part to expand missile defenses in response to North Korea’s increasing hostility. Orbital is in a strong position, as demonstrated in May, when the US tested its ability to thwart an ICBM heading from Asia. The exercise involved launching an ICBM from the Marshall Islands toward waters south of Alaska, then taking it out with an interceptor fired from California. Orbital provided not only the interceptor’s boost vehicle, but also the ICBM. On its website, Orbital describes itself as “the sole provider” of interceptor boosters for the Ground-based Midcourse Defense system—designed to intercept and destroy long-range enemy missiles—of the US Missile Defense Agency, which staged the test. Through its acquisition of Orbital, Northrop will get a proven launch provider, something that cannot be quickly built from scratch. That will help it compete for lucrative contracts in a number of arenas, not just in missile defense but also in satellites and replacing the US’s aging ICBMs. 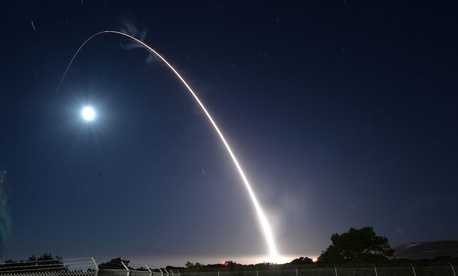 It isn’t just Orbital benefiting from increased interest in missile defense. Shares of one of its competitors, Aerojet Rocketdyne, received a boost after news of the planned acquisition. More broadly, this has been the strongest year-to-date performance ever for mergers of US aerospace and defense firms, with deals valued at $40.5 billion so far. Earlier this month, United Technologies said it would pay $23 billion for defense contractor Rockwell Collins. North Korean hostilities are helping propel shares of big US defense contractors, and it’s turning companies like Orbital into tempting targets.